I own a little mean Guyatone HD2, a distortion/fuzz pedal, plenty of gain and very bright... The manufacturer's website claims it is similar to a 70's Big Muff, but I've never made any confrontation... The sound is very good, very "harmonic" but it lacks a tone control... I guess with some little mods it could be a great effect. yeah, that one always seemed to be a nice sounding pedal. i'm interested! all right, as soon as i find my camera i'll take some photos! Maybe an opamp Little Big Muff or Muff Fuzz with buffered bypass? Sure ain't a BMP... BTW, I had a number of those tiny Guyatone pedals (not this one) some years back, and sold them all because of their significant tone-sucking--not a good bypass at all, whatever it is. thanks for the gut shots!!! or perhaps i could just upload it to an hosting site and post the link? You can attach it to a message here with the upload feature at the bottom of the reply screen. Or you could send it to me to re-draw. all right, here it is! It looks like all the components for the tone control are there, it is just permanently wired in the halfway position. You could remove R8 and R7 and replace them with a 100k control wired as is normally seen in a Big Muff. Can you see the value of R9 on your unit? 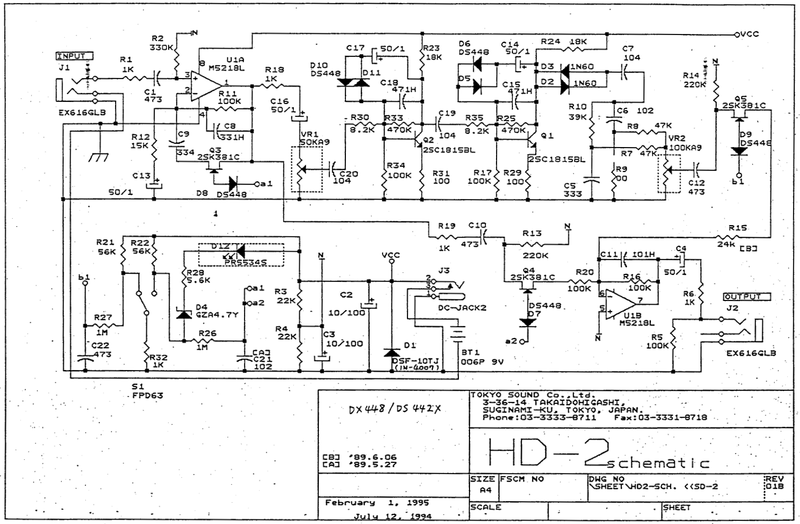 The value in the schematic is missing or incorrect. so a switch to include/exlude the1n60s could turn it into a more "classic" muff? Well, I'll be. I'm so used to seeing discrete in/output buffers on opamp-based circuits that it didn't occur to me that they'd sandwich the heart of a Big Muff between opamp stages, but it does make sense. Pretty cool. Hi, i reuploaded the schematic beacause it was no longer online! JellyBelly wrote: all right, here it is! Has anyone cloned this/ have a layout? EmmG wrote: Has anyone cloned this/ have a layout? I could make a PCB-layout clone according the shots above, but all attachments does not exist anymore.